I’ve been doing lots of thinking about this topic… FUN….Make your exercise plan fun for you and odds are that you’ll stick with it much longer. Here is the first question: What, of all the exercise you could do, sounds like the most fun? It doesn’t have to be something traditional or something anyone else would choose. I like physical work like raking, walking, moving piles of wood, even chopping wood. If I like a particular workout, I stick with it longer, and don’t notice the time passing. Because of this, I work at it long enough to actually feel the results, just as if I signed up for a good workout class. If you don’t like traditional fitness regimens or work out classes, pick something else – anything that makes you move your body. Whatever you want. I happen to be fascinated with the way muscles grow strong, which leads me to try all sorts of off-the-wall things. Once I even shoveled two pickup truckloads of landscaping rocks just to see if I could do it. I was pretty damn pleased with myself too and had a great workout. Okay, that might not be your idea of fun, but once you expand your horizons, the opportunities are endless. I once ran the usual road races or signed up for 10-week fitness classes, etc. They all worked well, for a long time. I ran more 5Ks and 10Ks than I can count. I signed up for all kinds of fitness classes – jazzercise, kickboxing, pilates, kettle bells, you name it. But eventually, I’d get bored and stop going. So this year, after several years of no road races, I signed up for a few because they were hilarious. Just happened upon this one while we were staying in Austin, TX in February. This is a fundraiser for the Mountain Gorilla Conservation Fund, to keep Dian Fossey’s dream alive. Sign up and you get a complete gorilla suit, free beer and constant laughs. I hadn’t even been running much but thought, why not? I went into this race with nothing but fun in mind, and turns out, I ran my best 5K EVER – full fur suit and all. Makes you really stop and think about how you approach exercise, doesn’t it? 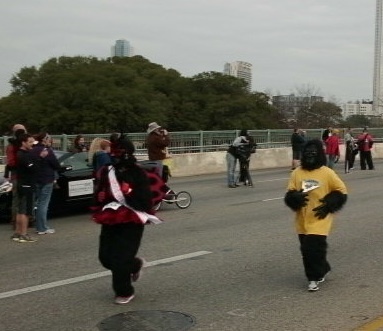 Hands down, the Gorilla Run was the most fun road race I’ve ever run. It inspired me to add some new fitness events back into my routine – but only if they made me smile…. I discovered this race this summer. If you haven’t heard of it, it’s a “mud crawling, fire leaping extreme 5K from hell” as described on their website. What a riot! I wasn’t sure how to train, IF I should train or how I’d do on the course. After I checked out the photos and the video on their website, I was intrigued enough to send out an invite to my friends to join me. The only taker was my brother-in-law, but we had a lot of fans there to cheer us on. These Warrior Dash races are all the rage right now – this event had thousands of runners, released in waves of 500 every half hour. The course had 16 obstacles including climbing fire, rope walls, crawling in trenches under barbed wire, mud trenches, a wrecked car obstacle course – all between short runs to add up to a 5K. I have to admit I haven’t tried some of these things since I was a kid, but was surprised at how much I could really accomplish once I quit worrying about getting dirty and just played. Fun. On the lookout for other fun things to do….send your suggestions over!